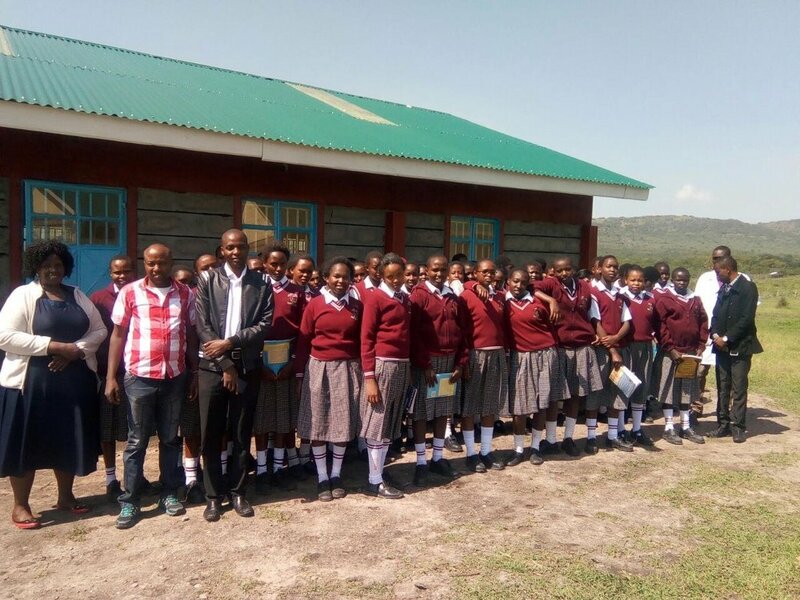 Five months after the launch of the Kenya project, construction of the library and media center at Siana Girls’ Secondary School was completed in November 2017. The fully operational center opened in January 2018 at the start of the new Kenyan school term. The two-room facility now serves the whole of Siana Girls’ Secondary School (SGSS), where attendance nearly doubled over the past year. Staff at the girls’ school and our partner MAO Kenya are currently in the process of furnishing the center with age-appropriate books and technology. The center was built in the center of Siana Girls’ Secondary School’s campus. During the construction, volunteers and laborers added thick bars to the windows of the structure to add extra security for the technology and books that are now stored there. Shelves and desks were built during construction. SGSS staff and members of MAO Kenya purchased books this week and are working diligently to get the school connected to the Kenyan power lines. If they are able to confirm that SGSS will have electricity, they will purchase standard computers for the students that will be used to teach basic computer skills. Otherwise, solar charged computers and their accompanying solar panels will be purchased.